This card is quite different to my usual style, but you know sometimes you need a quick, clean and simple card to congratulate someone on something awesome. I like to make those cards bright and cheerful and I think Coastal Cabana, Strawberry Slush and a little bling do the job well. The Star Framelit Dies (which I used to cut the stars) are a fabulous investment and we now have 3 different stamp sets they coordinate perfectly with. Here's the 'Be The Star' stamp set I used today. You can view all the other products I used on today's card in the links at the bottom of the post. Now it's time to see what the other Stampin and Blogging girls around the world have been up to. Thanks again for stipping by today. See you back here again tomorrow. Hello. I've been playing with the Many Merry Stars kit from the Stampin' Up! Extra Special Christmas Supplement. All the pieces for these stars (plus another 22 ranging in size from 5.1 to 38.1cm) are included in the kit, along with lots of embellishments, die cuts and wood veneer embellishments. I also added some rhinestones coloured with my Cherry Cobbler Blendabilities, and some linen twine with punch shapes attached. For the tree base, I used one of the small plastic medicine cups turned upside down, and I covered it with Early Espresso ribbon using Tombow glue. There are lots of things including star boxes, scrapbook pages, cards and more you can make with this kit. Here's a look what's in it, along with two great videos giving you lots of ideas and tips. 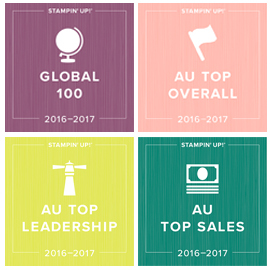 I hope that's given you lots of inspiration to play with the Stampin' Up! Many Merry Stars simply created kit! You can see or buy any the products I have used for this project using the links below. There's a big trend in the memory keeping world to do an album in December , with daily records of what your family gets up to in the lead up to Christmas. I believe this trend started with the very talented Ali Edwards. Love the way she encourages us to record our lives. With the collaboration of Becky Higgins Project Life and Stampin' Up!, we are able to join in on the fun with our very own product range to document YOUR December. We have just released the fabulous Hello December Project Life card kit, accessory kit and matching album. Today some of the girls from the Memory Keeping with Stampin' Up! Project Life FB group have put together some posts to show you how we are starting our albums for December. The idea is that you do as much as the album as possible beforehand, and then just fill in the journalling and add the pictures in December. here is my cover page. For my cover page I used some of the cards from the card kit, as well as a couple I made my own using the December Wonder Stamp Set and the embellishment pack. You can view all these products in the links at the bottom of the page. Here's the first couple of daily pages. I am starting each day with a right hand page, and will decide if I just want back and front, or to add extra pages as I go along. I love the cards that are included in the card kit for numbering the days. There are 31 of these, and stacks of printed cork numbers in the accessories kit, enough to make all the numbers 1-31. You can also circle the day of the week. See those cute little phrase stickers? There are tow sheets of those (half in Cherry Cobbler and White, half in black and white) in the accessory kit. Together with the wood veneer accents, I think these are my favourite bits in the accessory pack (although I am loving those cork numbers too!). I've done a few other things to get prepared for my album too. I'm a big fan of strip journalling, so I have done up a whole sheet of phrases and titles I expect to use on my album. I've also made some additional flair buttons, using the digital versions of the December Wonder stamp set and Hello December card kit. These are one inch shapes made in MDS and covered with clear epoxy circles. I made them in the colours which coordinate with the kit too, so everything is matchy matchy! I also made us some additional 3x4 cards using some of the embellishments in the Hello December accessory pack. I hope that's given you lots of inspiration to get started on your December albums! 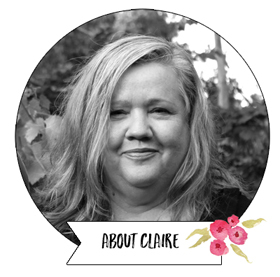 You can view the full product range in my Stampin' Up! Online Store, and I have also shown the products in more detail in this recent post. Thanks for visiting today. I look forward to seeing you back here again tomorrow for some more inspiration. Having a break from Christmas cards today to show you another of my favourite stamp sets from the 2014 Stampin' Up! Annual Catalogue, called Choose Happiness. Even the name of this stamp set makes me happy! For the circle layer, I have used the Cracked Glass technique. If you want to have an antique type look, you can also rub some Soft Suede or Crumb Cake or even early Espresso ink into the cracks. Here's a look at the Choose Happiness Stamp Set. I love the sentiment in this one too. Two other very cool products I wanted to showcase in today's card, are the I Love lace background stamp, and the Party Pennants Bigz L die. The background stamp is amazing! Such beautiful fine detail. One of my all time favourite background stamps. Check out the links below to view / shop in my online store. The Party Pennants Bigz Die is very cool for adding extra layers on cards, as well as for what it's intended - making banners. I love the different shapes and sizes you get. Check out the links below to view / shop in my online store. I hope you have enjoyed today's card. 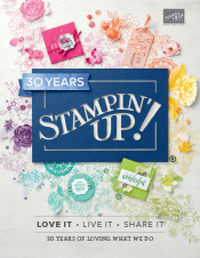 here's a direct link to the products I have used in my Online Stampin' Up! store. I'm using a new link builder which is a carousel, so you can scroll sideways through the products. 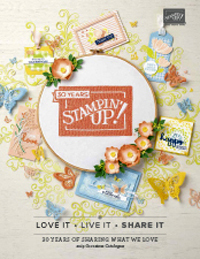 It's Weekly Deals Time - Discounted Stampin' Up!